Producing process maps in electronic format can save a lot of time and money. The example below, “How to Buy and Sell on eBay” shows some of those benefits. 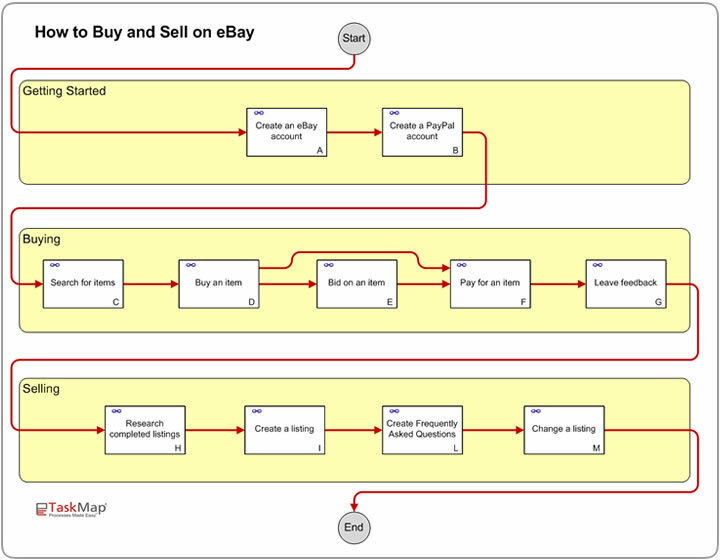 The "How to buy and sell on Ebay" TaskMap was created to show how Process Maps can be used as a guide for online users of the eBay system. Simpler to follow, precise instructions: By using TaskMap, all the steps in a process are in visual format eliminating unnecessary word clutter that comes with eBay text based learning center. A picture is worth a thousand words. Most tasks requiring clicking on a hyperlink have a screen shot of eBay’s buttons that remove the ambiguity in tasks. Listing preparation made simple and time savings: By reviewing the How to Buy and Sell on eBay TaskMap prior to starting the selling process, a person is able to obtain all the pictures and required information that he/she will need in order to place a item for sale and effectively sell. This TaskMap also outlines the process of researching an item before attempting to sell it; giving an idea of how to effectively market an item on eBay at minimal cost and maximum profit. Hyperlinks and Guidelines: The hyperlinking function allows for accessibility to pictures, documentation, repair orders, websites, etc… Hyperlinks within this TaskMap point to specific information and guidelines providing deeper insight on how to complete a task. The Guidelines function allows illustrates tips on performing a task to be quickly identified. These tips are useful for effectively navigating around the eBay site and maximizing profits for sellers. Higher quality and professional listings: Using a TaskMap flowchart for an eBay Buying and Selling process creates a standard for how to create listings. Using repetitive tasks eBay from a predetermined process greatly reduces the number of mistakes made in an item’s description as well as creating a consistent look and feel for all listings. This projects a professional appearance of the listings and consistency in look and feel adding a level of security in buyers’ minds. Paper and storage savings: TaskMap allows instructions to be displayed from any computer. This eliminates the need for paper versions of this information. Since eBay is a purely electronic company, there is no need for a paper-based how to guide.